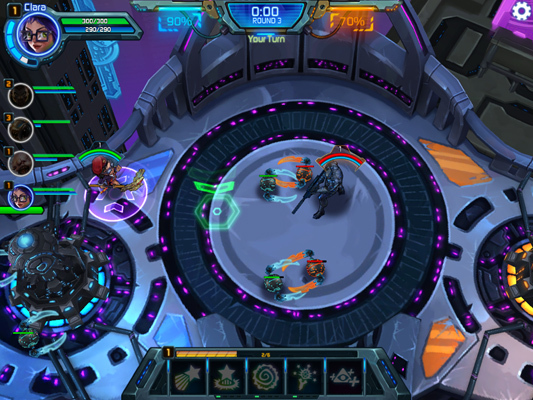 Arena of Heroes is a relatively new Turn-based Battle Arena brought to us by Sneaky Games. The game is similar to MOBAs such as League of Legends or DOTA2, but with a turn-based twist. 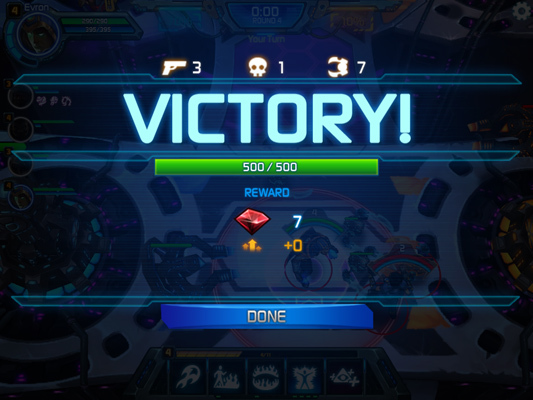 You can collect heroes and lead them into galaxy-spanning war. There are PVP rank ladders to climb and a variety of ways to play. 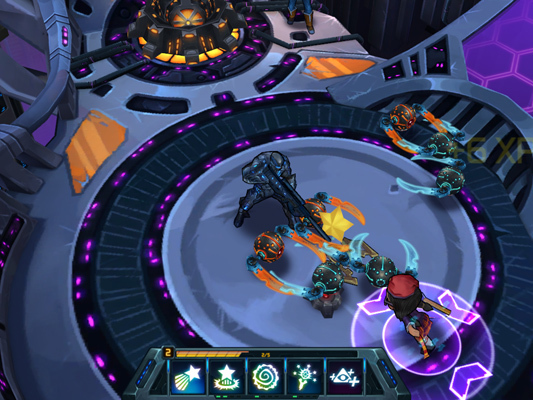 Arena of Heroes has all the ingredients for an addicting Battle Arena game. Just as you would expect, you can purchase heroes and skins. There is a decent selection of Heroes, and you’re given a decent number of them to work with in the beginning. As the game is still relatively new, the skin selection isn’t that large. You can gain the currency to purchase the Heroes and skins by playing the game or by purchasing the currency from the shop. While in a match, you can upgrade your heroes’ skills. Unlike other MOBAs, you won’t have to worry about purchasing items or improvements as that’s not part of the game. 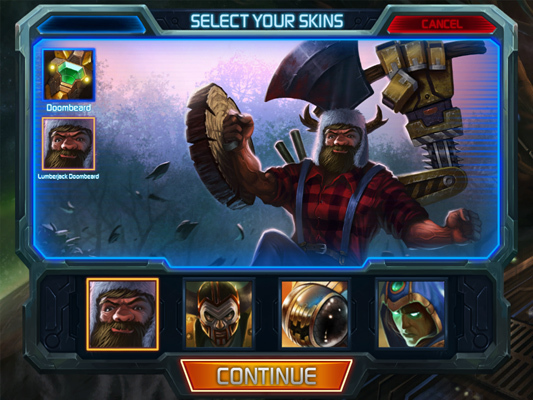 Basically, it’s the level of customization you would expect from a MOBA. 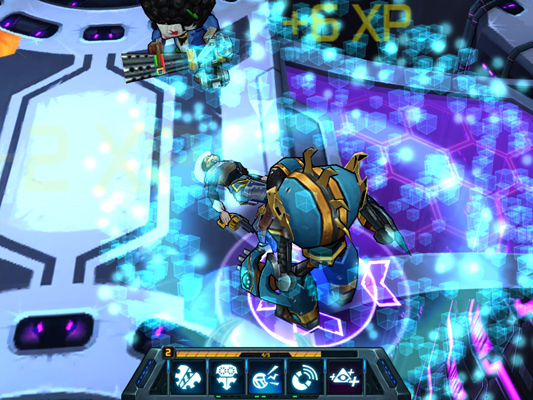 Arena of Heroes has 3D graphics with a default isometric perspective. However, it is possible to rotate and change the camera perspective freely, so you’re not stuck with it. The quality of the graphics isn’t very high, with both models and textures being fairly simple. I believe that this is a purposeful choice to make the game more accessible to those with lower-end PCs, and to make the cartoonish style of the game stand out more. I personally enjoyed the cartoony sci-fi style chosen for the game, but wish there was a bit more detail. Although there are keyboard hotkeys, you will probably end up doing most things with your mouse. This includes the movement, selecting attacks, and other things. The game is designed for mobile devices at its heart and the UI reflects this simplicity. You can change your camera perspective using the right mouse button. Personally, I liked that I wasn’t stuck with the usual isometric perspective that MOBAs tend to have. For the most part, the controls were quite responsive, however I did feel that they were a bit rough around the edges. I’m sure that they’ll be smoothed out over time, though, and it’s not a game-breaking issues. As Arena of Heroes is still fairly new, the population is pretty small. Depending on the time of day you log on, you might find that you cannot find another player to play with. 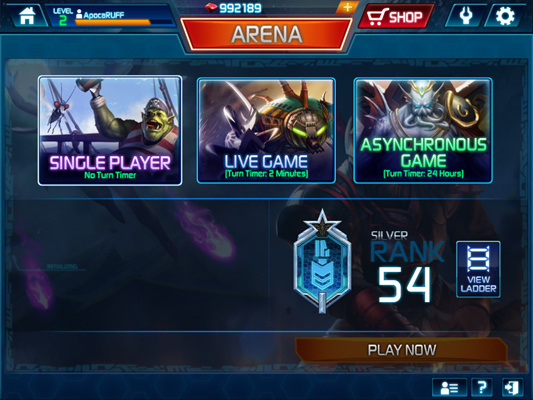 On the other-hand, if you get on during the various ‘prime times’ you might find that you get a match within a few seconds of entering the queue. Arena of Heroes is pretty unique in the Arena Battle genre. It’s a MOBA with a turn-based twist. This is something quite refreshing in an industry that seems to center around doing what works with little-to-no innovation. However, don’t be mistaken, if you’ve played League of Legends or DOTA2, you will be almost instantly familiar with this game as, past the turn-based combat, it sticks to the MOBA formula closely. This isn’t bad however – the insane popularity of MOBA games is a testament to the fact that something in the formula works. It’s a mixture of what works and new ideas, which is just what I like to find in a new game. Something that is quite awesome that the turn-based combat allows for is asynchronous play. That means that you can play matches with others that have up to 24-hour turn timers which, as you might guess, means that the match could possibly drag on over several days. This is great if you want to play with a friend in a different time zone, or just want to play a lot of games at once for whatever reason. There’s also the usual real-time and AI matches. Games are played One versus One, with each player choosing several heroes to play with. Each hero is given a certain number of action points, which are used when you move or when you do an action. This is a bit different than how most turn-based combat games do it, as they usually have separate pools for movement and action points. While it’s not as fast-paced as other games in the genre, it’s just as intense when it comes to strategy and tactics. There are three lanes, each with a sentry turret. The primary goal is to bypass the enemy sentry turrets while protecting your own so that you can get to the enemy base. You won’t have an easy time of doing this, as you’ll have to worry about the enemy Heroes, the enemy minion bots, and even the sentry turrets themselves shooting at you if you get too close. Positioning yourself just right so you can get off your attacks, while making it difficult for the enemy to attack you without putting themselves in danger is an important skill to learn. I felt the matches had an odd pacing at first. Sometimes things would feel like they were going too slow, but (oddly enough) it felt like things were going a bit too fast more often than not. When I first started playing, matches would seem to end just a handful of minutes after they began, seemingly for no reason. Each time has a sort of “health” pool and when one reaches a certain threshold, the match is over. This can be tens of minutes, or just five minutes after the match starts. Arena of Heroes is a pretty neat tack on the MOBA genre. It takes what works and gives it a unique twist, which is something we don’t often see. I’ve got to commend Sneaky Games on making their game so accessible as well. However, while I enjoyed the gameplay, I felt the controls and graphics need a bit more polish. All-in-all, I enjoyed the game and would recommend others give it a try if they enjoy the turn-based genre, as you will more than likely enjoy this title. As Friday the 13th draws closer, the creepy things will crawl out of hiding in Battlerite for the 'Tales of Horror' event.